Another fantastic place that your Carcassonne car hire can bring you to is Quillan. You will find it to the south of Carcassonne and it should take less than an hour to drive to. Quillan is surrounded by mountains so to say its a scenic area is certainly an understatement. As you would expect for this part of the country, Quillan is an idyllic little town, wonderful to stroll about and admire. Head for the old bridge and watch on as boats and kayaks flow down the river. The old castle dates back to the fourteenth century. It has been dismantled over the years and used in local homes however some of it still stands. A good spot for any visitor to start from is of course the tourist office which is quite unusual in Quillan as it was formally a bath house which supplies it with a unique charm of its own. Heading outside the town, you may wish to take in the lovely village – Camon while the nearby cathar castles are well worth your time. 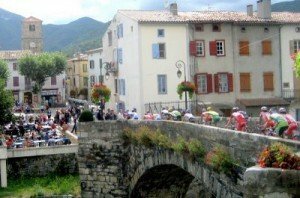 There are some splendid sights to admire in Quillan which is most obvious when you travel over the bridge and get a glimpse of the homes by the riverside. Here you can see the Pyrenees help form the perfect picture.